This post summarizes my perspective on the current outlook for US equities. It should not be taken as investment advice — my goal is to provide a detailed viewpoint to help people form their own opinions, and perhaps also to provide alternative evidence to some claims made by those who have been bullish on the stock market a little too often in recent years. Use your own judgment! (But give a variety of perspectives a chance). In short, I believe the downside risk to stocks (with the S&P 500 currently hovering over 900) outweighs the likely upside rewards even in the medium term. The best case scenario as I see it for stocks over the next several years is likely flat or slightly up, but the worst case scenarios are significantly down from where we are now. Based on history and fundamentals, the probabilities appear to be stacked to the downside. So to be outright bullish on stocks any time soon is truly to say "this time it's different". This crisis is comparable in nature to the Great Depression, Japan's post 1990 experience, and other debt deflations in history, and despite what has until recently been conventional wisdom, they were not triggered primarily by reactive policy errors. The crisis stage should (hopefully) continue to fade, but ongoing deleveraging will still be a powerful drag on risky assets. Some people believe that anyone who has had a bearish outlook so far was simply a pessimist and has "gotten lucky". While that may be true of some bears, others are better characterized as realists who predicted the crisis accurately and in detail and are still worth listening to. The "efficient markets hypothesis" is deeply flawed, and the markets have NOT already priced in all knowable information at all times! As a simple example, ask yourself what changed regarding the fundamentals of NASDAQ stocks between the index peaking around 5000 in March 2000 and the years following where it never breached 3000 again? (Answer: nothing!) The markets can be really bad at pricing in the macro outlook despite being efficient at setting relative prices. And stock markets are especially poor — credit markets have generally adjusted to the new economic reality faster than stock markets since the summer of 2007. Note I've pieced together this post over a period of weeks (so dates on articles and data may vary a little). Please see this related post on the nature of the crisis as I understand it. It provides essential context for this discussion. In particular, if I am wrong about the government's inability to generate inflation in the next several years at least, then equities may have more nominal upside potential in the medium term than I suggest here. Just in case you don't take the time to read that post, here is an alternate version of one of the most important graphs, debt-to-GDP. This particular version is a year old, but as discussed in the other post, the debt-to-GDP ratio (even if you count just private debt, excluding government debt), has yet to fall on aggregate. Consumer debt did just start to fall in Q4 2008 but corporate and financial sector debt had not yet shrunk at all at that time (Q4 2008 is the latest official data on total debt from the Fed). This chart from dshort (click for larger version) shows the performance of the S&P 500 since it peaked in October 2007 compared to the Dow starting in 1929 and the Japanese Nikkei 225 starting in 1990. They both remained down over 50% (excluding dividends) after 20 years! Japan's is down 70-80%. Yes, there are some differences between the US and Japan, but not as many as you might think — check out Richard Koo's talks and slides (linked in the nature of this crisis post). The Nikkei did have a higher price/earnings ratio at the peak than the S&P 500 did, but the S&P 500 arguably had a bigger earnings bubble given the amount that Ponzi debt-growth dynamics contributed to earnings since 2003 — see the chart below. Carmen Reinhart and Kenneth Rogoff have studied many financial crises, though the types were broader than the "balance sheet recession" that Richard Koo categorizes this crisis as. Their most recent paper is here. According to them, the average time it takes the stock market to bottom is 3.4 years, so it would be surprising if global stock markets bottomed as soon as 2009. The average fall is 56%. Perhaps this means markets today aren't likely to go much lower, but that is only an average, and this crisis is bigger (with respect to debt levels) and more global than any before, and that 3.4 year average also doesn't speak to how quickly a rebound would occur. The study lists Japan's post 1990 stock market as taking three years for peak to trough decline, yet one look at the mega-bear quartet chart above shows that the three year bottom was only temporary with the market still finding new lows after two decades. My main point in referencing this study is that recessions or depressions associated with financial crises tend to have inherently longer recovery periods than normal business cycle recessions. The situation today shouldn't be compared to cherry-picked statistical data regardingly only post World War II US recessions. Wall Street and the investment industry in general are a large and powerful force in shaping opinion. The cigarette industry once helped shape conventional wisdom on the safety of cigarettes, but since then conventional wisdom has thankfully changed. That is not to suggest that there is malicious intent in finance, just to recognize the extent to which a commercially self-interested industry has shaped our view of reality by focusing on selective historical statistics that highlight support for the products they sell (especially stocks and mutual funds). Regarding the consistent advice that there is a never a bad time to buy and hold stocks for the long run, as Upton Sinclair said, "It is difficult to get a man to understand something when his job depends on not understanding it." Now I don't mean to overdo this point, as I believe most in the financial industry are genuine. And the "rules" and "best practices" devised by the industry can appear to work well for long periods of time — but unfortunately such rules fail dramatically during rare events like financial crises. In times of financial crisis, a real understanding of crisis macroeconomics seems (to me) much more valuable in guiding investment decisions than knowledge of traditional portfolio management best practices derived from what has worked during "normal" times. An additional observation is that financial advisors can afford to be wrong if they act according to "best practices" and everyone else was wrong too, but if they are wrong while acting contrarian, their clients are much less likely to be forgiving. That alone is a powerful incentive toward groupthink. A relevant quote from a recent Barrons article: "Those who didn't get on board the rally that's taken the U.S. stock market up by a third from its early March lows face "career risk" if, like most, they lost a boatload of money last year." We have been conditioned to think of the stock market like an external "black box" resource to be mined for wealth and have been shown lots of data about its long term performance without nearly as much analysis (in my experience) of WHY it might have performed that way and what could change in the future. Yet in reality, stock prices are dependent not just on earnings trends, but on the collective emergent outcome of human behavior in the markets (reflexivity is a relevant concept). If everyone piles into the stock market (because statistics say they provide the highest long term return) but doesn't bother to evaluate whether current prices are actually reasonable, then of course bubbles in prices can form (e.g., US stock prices leading up to year 2000). Some people describe a Cult of Equities. If it were to occur to enough people that perhaps the outlook for stocks is not quite so consistent decade-to-decade as we've been led to believe, or when the Baby Boomers start retiring and drawing down their retirement accounts, lower stock prices and P/E multiples would likely result. Ultimately dividends (and expected future dividends, and earnings if used for share buybacks) should be what matter the most in setting stock prices, but prices diverge from these fundamentals during bubbles (and frequently overshoot on the downside when bubbles burst). Many "concensus" forecasts of earnings and stock prices are done by analysts. History suggests that in aggregate, analysts lag reality! See the chart (one year out of date) (click for full sized version) showing how aggregate forecasts simply follow the existing trend in earnings, but with a time lag. Of course, some individual analysts likely do much better. Industry and academic economists on the whole have done no better — look at how few predicted this crisis. Yet the warning signs were very visible. For example, The Economist magazine had a cover story called House of Cards as early as May 2003 that warned of prices being increasingly out of line with price-rent and price-income ratios. If I recall correctly, a study was cited of past housing bubbles having had at least twice the negative impact on the economy per percentage point of decline when they pop as stock bubbles — yet somehow the housing bubble wasn't acknowledged by most economists until 2007, two years after prices peaked. The point of this section is to be careful about the amount of weight you put on the advice of "experts" or consensus forecasts, and also to not assume the market has priced everything in and that there's never a bad time to "buy and hold". Remember that the majority were wrong before in not foreseeing this crisis, so if the same economists are still making predictions there's a good chance they may be wrong again, especially if they don't understand the underlying dynamics of the crisis any better than they did before it started. Nobel laureate economist Paul Krugman has said we are living in a "Dark Age of Macroeconomics" (a phrase I've used myself in past years!). And the financial industry unfortunately bases a lot of its knowledge on bad economic theory (post-Keynesian economist Steve Keen is especially vocal about this). That said, the industry does offer commentary worth listening to if you are selective, willing to critically evaluate it, and keep in mind the possible vested interests of the commentators. Of course you should be just as critical in reading this post, but I hope the third party references I cite give add some weight to my viewpoint. Stocks are currently expensive by traditional measures. An official spreadsheet of stock market statistics is available from Standard and Poors here. As of 5/20/2009, with the S&P 500 at 904, it shows stocks as having high P/E ratios (Price/Earnings is a measure of expected future growth prospects) in every measure offered, both current and based on future estimates of earnings. "Reported earnings" are what was actually earned after losses. "Operating earnings" are earnings after subtracting many "one time" charges. Operating earnings have significantly diverged from reported earnings over the last decade or longer as companies stuff everything they can into the "one time" category, so it's controversial to use that number. Even looking at estimates as far ahead as 12/31/2010 shows reported earnings P/E at 25, and as discussed, analyst estimates are very unreliable. Robert Shiller shows the P/E based on ten year trailing earnings (adjusting earnings for inflation) as around 15. That is slightly more reasonable but still not cheap, especially given reduced post-bubble prospects for future earnings and tendencies to overshoot on the downside. The stock markets in past major recessions and depressions have bottomed out at a P/E ratio of between 6 and 11. If 3/9/2009 really was the bottom, the high P/E ratio seems unprecedented. It is possible it was the bottom, but it is important to think about whether that conclusion is made based on wishful thinking and undue optimism or evidence that the fundamentals and aggressive government response really are enough to make true "this time it's different". The chart below (click for full sized version) is unfortunately half a year old but still should give some perspective on the way in which price/earnings ratio moves between higher and lower points as the economy cycles. 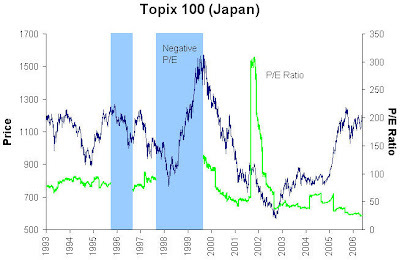 There does seem to be one potential counter example I'm aware of (and there could be others I'm not aware of) — Japan's Topix market P/E ratio appears to have stayed elevated (other than flipping negative for two periods) for many many years after the 1990 bubble peak, and only now has fallen to around 10. So it is possible that price/earnings ratios are simply not as relevant in all balance sheet recessions. Or perhaps Japan style intervention just means fundamentals adjust in extreme slow motion. Click on the chart below for the larger version of Japan's P/E ratio from 1993 to 2006 (which are the broadest dates I could find, unfortunately). While the credit crisis may disappear, the recession or depression is an independent (though overlapping) phenomenon that can continue much longer. Richard Koo reported that Japan only faced two relatively brief credit crises in its post 1990 experience, yet growth has been anemic, residential real estate is still down over 40% after two decades, and commercial real estate and stocks are still down over 70%. See also the end of the nature of this crisis post — we are a quarter of the way through the IMF's estimate of global banking system losses (half way through for the US), though the IMF has been too optimistic with each estimate so far. Housing price declines have shown few signs of slowing (see additional graphs from Calculated Risks here), and now rents are falling as well (due to both excess housing supply as well as more people sharing residences to save costs), meaning prices have to fall even further to reach reasonable price/rent ratios. 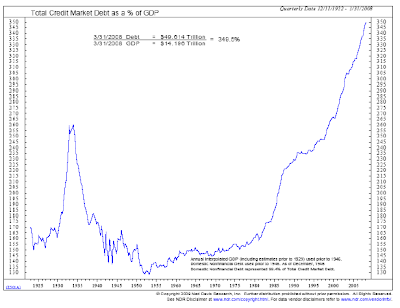 And deleveraging (debt reduction) in aggregate has barely begun (see the end of the nature of this crisis post for details) and there is no way that a 350% debt-to-GDP ratio is sustainable without continued Ponzi asset price growth. "Going forward, it seems probable that many U.S. households will reduce their debt. If accomplished through increased saving, the deleveraging process could result in a substantial and prolonged slowdown in consumer spending relative to pre-recession growth rates. Alternatively, if accomplished through some form of default on existing debt, such as real estate short sales, foreclosures, or bankruptcy, deleveraging could involve significant costs for consumers, including tax liabilities on forgiven debt, legal fees, and lower credit scores. Moreover, this form of deleveraging would simply shift the problem onto banks that hold these loans as assets on their balance sheets. Either way, the process of household deleveraging will not be painless." Here is a perspective on the impacts of necessary debt reduction by Jeremy Grantham of GMO via Clusterstock (though he falls into the group that thinks inflating will eventually succeed, while I fall in the camp that believes it will very likely not (Japan tried! ), best summarized by Steve Keen). While central banks may succeed in conquering liquidity crises more successfully than during the Great Depression, the fundamentals with respect to solvency crisis appear significantly worse than the Great Depression. Steve Keen has expressed this viewpoint on multiple occasions given US debt levels of 350% today versus 180% at the start of the Great Depression (it jumped to 250% when GDP crashed). 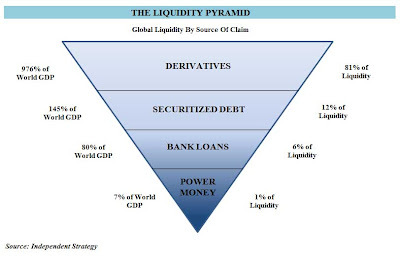 And that doesn't even count the added effect of derivatives today (hundreds of trillions of notional value globally) with respect to deflationary unwind effects and systemic risk — look at this chart and the analysis and reader comments at this summary of David Roche's liquidity pyramid. This the practical essence of why debt matters (beyond just the obvious inflationary money creation that occurs with bank loans) — it adds liquidity and increases the velocity of money, putting credit-based money to work in a way that drives asset inflation and to a lesser extent price inflation in way that is ultimately unsustainable (at least when it grows to the magnitude it has — debt is not inherently bad). "the world is currently undergoing an economic shock every bit as big as the Great Depression shock of 1929-30. Looking just at the US leads one to overlook how alarming the current situation is even in comparison with 1929-30. The good news, of course, is that the policy response is very different. The question now is whether that policy response will work." World industrial production, trade, and stock markets are diving faster now than during 1929-30. Fortunately, the policy response to date is much better. The update shows that trade and stock markets have shown some improvement without reversing the overall conclusion -- today's crisis is at least as bad as the Great Depression. Of course since productivity has improved dramatically since the Great Depression, we are starting from a better place (meeting basic material needs), even if relative losses (on GDP, unemployment, asset prices, etc) have the potential to be of comparable magnitudes. So the world should not have nearly so negative an experience overall as the GD no matter what the relative loss, and gauging whether this crisis is comparable by looking for soup lines is missing the point. However, other more important comparisons are also misused — asserting that this isn't like the Great Depression because unemployment isn't 25% misses that fact that it took four years (1929-1933) for unemployment to reach that level in the Great Depression, and this crisis began less than two years ago. Plus unemployment measures have changed a lot since then — the broader U6 measure is over 15% already. There are of course some other positive differences since the 1930s, such as FDIC deposit insurance limiting the likelihood of bank runs (though runs have occurred in the "shadow banking system"), but I haven't listed all the negative differences, either. Sweden resolved its 1990 financial crisis in what is considered by many to have been an effective way, in effect recognizing as many losses as possible up front and nationalizing the banking system. However, the underlying problem was much smaller from a debt perspective: 170% debt-to-GDP in 1990 for Sweden (127% private sector debt-to-GDP plus 43% public sector debt-to-GDP) versus 350+% currently for the US, excluding netted derivatives. Unemployment still rose in Sweden by 10%. By comparison, US unemployment has only risen less than 5% so far from the 2007 low. Swedish GDP fell 5%. Since peaking in Q2 2008, US GDP has fallen 3.2% so far (Q3 2008 through Q1 2009). So by those measures even in a Swedish-style best case resolution (if it were feasible) things will still get worse before they get better. The Swedish policy following the 1992 crisis has been often referred to in recent months. Sweden acted quickly and decisively to close insolvent banks, and to quarantine their bad assets into a special fund. [There were plenty of bad loans but at that time they did not have the non-transparent “toxicity” that “sliced and diced” CDO’s were to generate in the present crisis.] Eventually, all the assets, good and bad, ended up in the private banking sector again. The stockholders in the failed banks lost all their equity while the loss to taxpayers of the bad assets was minimal in the end. The operation was necessary to the recovery but what actually got the economy out of a very sharp and deep recession was the 25-30% devaluation of the krona which produced a long period of strong export-led growth. Needless to say, the US is in no position to emulate this aspect of the Swedish success story. Looking at the graph below, the Swedish stock market did have a dramatic rise between 1988 and 1990 (more than doubling), and then it fell roughly in half in the two years that followed. It then recovered quite dramatically and reached new highs. US policymakers so far have at almost every turn followed the Japanese playbook rather than the Swedish playbook — propping up the large banks, assisting in regulatory forbearance to recognize losses as little as possible (see for example the recent suspension of mark to market accounting), etc. There may be good reasons why the Swedish approach is not feasible for the US (I'm not going to try to judge that here), but the point is, we're not following it, suggesting an outcome closer to Japan's experience — if we are lucky. If policy response were to dramatically change, that could be a plus for stocks after the initial pain to equity positions in recognizing losses (which could be big), though the following factors I list would still be an issue. Today's ponzi debt bubble problem is much bigger and more global, and the financial engineering (securitization, derivatives, etc) much more complex. Little prospect of a booming global economy to export to. People have an inherent optimistic bias. I think the predisposition was 70% optimistic if I remember correctly from the book Authentic Happiness. Most of the time this is a big benefit and leads to happier lives, but at times when reality doesn't play along, this predisposition can lead people badly astray (and may go a long way to explain bear market rallies). This is not to say pessimism is preferable — the goal should be realism with respect to topics in which the stakes are high. Yves Smith covers some additional thoughts on optimism here. When considering whether to sell stocks, any losses so far are a sunk cost, other than tax implications of selling. This is not just a business cycle recession, it is a "balance sheet recession" (and Steve Keen who has been mathematically modeling financial crises since the early 1990s and predicted this crisis thinks a depression is inevitable). The conventional wisdom is that stocks bottom about six months before the trough of recessions, but the historical record shows that stock market recoveries coincide with or lag recoveries in this type of downturn (sorry can't find the links right now). US corporate earnings since 2003 have been significantly boosted (to record levels) by leverage and financial engineering. This applies not only to banks — many companies in other industries (e.g., GE, GM/Ford, AIG, etc) relied on financial engineering leverage and profits from consumer financing to drive earnings growth. We are likely to transition to a lower leverage, higher regulation environment. These factors alone make a near term return to prior profitability levels practically impossible. As one example (many have commented on this), Pimco's Mohamed El-Erian writes about this here. The rational expectations hypothesis (and related efficient markets hypothesis) that suggest aggregations of individuals are hyperrational and have priced in all available information is deeply flawed. See for example comments from Steve Keen (and here on EMH). Or here from John Quiggin. Some market bulls like to talk about how much cash is "on the sidelines", implying it's all ready to pounce back into stocks and you'd better beat the stampede. Yet this is very misleading — the money supply doesn't change just because people buy or sell stocks (for every buyer there is a seller! ), all that changes is who holds the dollars versus the shares and how much people on aggregate think the stock market is worth. If the ratio of cash to stock market cap is higher than pre-crisis, the amount of cash probably didn't change much, the change was almost entirely due to the value of the market declining! See comments from Mish on John Hussman. Stocks are one of the asset classes most negatively impacted by deflation. And deflation (whether gradual like Japan's or sharp and deep like the Great Depression) appears inevitable. If the world really does become mired in a half decade or longer stagnation (TBD), geopolitical risks will keep rising. The majority of wars in history have had economics as one of the key causes. I don't spend much time dwelling on this possibility as it's certainly far from inevitable, but it could present real downside risks to the economy. It's harder to envision huge upside surprises, even if the best case scenario unfolds. Over the medium to long term, asset prices (stocks included) can't sustainably rise faster than underlying economic growth (plus inflation). The concept of a snap back to a "potential growth" trendline after any recession or downturn will likely not prove accurate in this type of downturn (can't find the links yet but I think Steve Keen and others discredit this notion). The Economist Magazine discusses the likely slower growth ahead for the US. I disagree with some points they make but agree with the growth related ones such as diminished growth of labor supply in the years ahead, the impact of the debt burden, and the difficulty in modern highly specialized workers in adapting to new/different jobs such as from fiscal stimulus. Some people have taken comfort that the head of the Federal Reserve, Ben Bernanke, has a reputation for being an expert on the Great Depression, the implication being that he knows how to avoid the same "mistakes". Unfortunately the reality is that Bernanke's understanding on this topic is severely flawed (and he certainly didn't see this crisis coming). Several commentators (including ZeroHedge which features some very savvy market commentary) suggest that there has been market manipulation at work (likely government sponsored) that has amplified this rally, and they present evidence. I am not qualified to judge this evidence, other than to say that the means (Goldman Sachs and other Supplemental Liquidity Providers) and the motive (shock and awe style boost to consumer confidence, since stock market direction is a big component of confidence measures, as well as an opportunity for banks and other companies to raise capital via new equity offerings in the market) both appear to be there. Perhaps it is just a tin foil hat conspiracy theory. Either way, Japan's government tried to support their stock market. Whether that market would have been lower without intervention is an open question, but it has hardly experienced a sustainable bull market over the medium term (since 1990). The real downside risk — and I like to think it is small but no one knows since we have the largest and most global debt bubble in history — is an uncontrolled cascading debt deflation (propagating defaults) worse than the early 1930s. I'd like to think policy makers can avert this without backstopping the entire $42 trillion private US debt (which would be a disaster for taxpayers among other problems), but the risk is there. Nassim Nicholas Taleb, an author and finance/math expert who was another person who predicted this crisis, has commented in the past on having trouble sleeping at night given how worried he is about the tightly coupled interconnectedness of our global systems (not just debt but also supply chains and everything else). As an illustration of the problem of cascading insolvency, one theory on why the Obama administration seems so intent on rescuing the bondholders of financial institutions and not making them share the losses (so far) is that many of the bondholders are insurers and pension funds, and the fear is of cascading effects to all those institutions and beyond. With insurer solvency in question there would be the potential for a massive self-reinforcing runs on the insurers if people feared insurance policies wouldn't be honored. Long term stock market growth is a function of productivity increases, inflation, and changes in demographics. To the extent that population growth slows in developed nations, this may be a drag on future equity returns, though admittedly this is a multi-decade trend, not several years. Unfortunately from the perspective of future stock market growth, birth rates decline during difficult economic times (e.g., 26% drop during the Great Depression, and I wonder whether Japan's malaise could have contributed toward a self-reinforcing adverse feedback loop with the country's birth rate). Emerging markets will, at some point beyond this crisis, likely provide strong longer term returns, but it remains to be seen whether global capital markets remain as open as they have been. The baby boomers will theoretically start retiring in increasing numbers in several years. They will no longer be adding to stock market investments, but instead drawing them down for income to live on. This is only an issue to the extent they do this to a larger degree than younger generations save for retirement, but given the demographics this may be a real concern, and I have seen others comment on it. There are some reasons for slight optimism. However, it's not clear that these factors are large enough to counteract the many negative factors and downside risks. Japan's current stock market capitalization as a percentage of GDP seems to be very roughly in line (+/- 20%) with the United States' (in the vicinity of 70% of GDP). If the US were to embark on similar (but larger, to match the larger problem) types of policy response, stocks could already be roughly fairly valued in the medium term, despite unavoidable significant short term downside risk. Japan managed to sustain a high stock market P/E ratio, though I'm not sure why (the government did intervene to buy stocks but I was under the impression this was not sustained over long periods of time). Perhaps the US will have the same experience, though even if it does I don't see it causing a big jump in stock prices from current levels, just less downside. The best case for government policy response (and not everything done so far has been best case!) could minimize the risk of further stages of financial crisis. Massive liquidity support tools have been deployed by the Fed, but they don't fix the solvency/debt issue for which the fundamentals themselves have to painfully mend. Some commentators talk about a "fake recovery" — i.e., the massive fiscal and monetary stimulus could be enough to generate a measurable bounce in economic activity (lasting from months to a couple years). Yet this would not mean the underlying issues were all addressed, and the problems would resurface. And personally my interpretation of the evidence will leave me surprised if we have a bounce lasting more than a few months if it happens at all. So far all we have are economic measures that are falling slightly more slowly, and a tremendously optimistic stock market. But one thing that continues to surprise me is the frequency with which the US in 2007-2008 is being compared to the US of 1929-1930. I've mentioned in passing that China is in the position that the US occupied in the late 1920s: a massive manufacturer that was generating large trade surpluses, to the point where the imbalance was destablizing (under a gold standard, the US was sucking the metal out of its trade partners; the modern analogy is China's massive foreign exchange reserves). And as the US was the epicenter of the Great Depression, we cannot be certain of the trajectory of this economic crisis until we have a sense of how bad things are getting in China and how good its policy responses are. For a look at the short term (not just the medium term, which has been my main focus), here is a selection from observers who believe that the "green shoots" optimism is way overblown and that the latest stock market bounce of 30-40% is just another bear market rally (the implication being of course that in the short term at least the market could plunge to new lows). Note that this is not intended as a balanced summary of all perspectives — I know there are plenty of articles out there that make the rosier "green shoots" case but I don't have time to connect a sampling of them to analysis of where they may fall short. I could have also listed a great many more for the "bear" case — this is just a selection. April Economic Summary in graphs — look at the graphs to see the big picture directional changes and how many minor "green shoots" have come and gone before. UPDATE: May Economic Summary in Graphs now available. [NOTE: Calculated Risk is a great source of graphs of the raw data, this is especially worth looking at]. Green shoots and tea leaves — things never move in a straight line, even in the Great Depression. Green Shoots and Glimmers — things are still getting worse, just a little more slowly. Sales misses — and evidence of upside earnings surprises so far being attributable to layoffs (which is not sustainable). Also there are many skeptics of the Chinese recovery story (elsewhere also). Examining Market Sentiment and "Yet more evidence we're in a bear-market rally" — changes in market sentiment look more like past bear market rallies than past recoveries. Rail car loadings — one of many measures that don't show any green shoots, so far. Update on inventory correction — look at the second chart, ratio of inventory to sales, it has leaped! This suggests an inventory restocking driven recovery may not be imminent or large. The next asset classes to default — there are many criticisms of the recent bank stress tests. One is that the "Treasury didn’t even try to guess the value of assets on banks’ books which mature after 2011"). Equities still a bubble and equity guys out of this world, BNP Paribas says — discusses earnings. Insider Selling Jumps to Highest Level Since 2007 — Corporate insiders have been selling into the rally. Enjoy the rally while it lasts - but expect to take a sucker punch — Ambrose Evans-Pritchard comments on 1931's green shoots as well as looming deflation, as well as a comment that "genuine bottoms tend to be 'quiet affairs', carved slowly in a fog of investor gloom." Unemployment Claims: Continued Claims at Record 6.79 Million — the shape of the continued claims graph is not reassuring given the huge negative impacts of unemployment on spending, ability to service mortgages, etc. Berkshire Hathaway's Sokol: "No Green Shoots"
Green Shoots or Smoking Weed? — focuses on the deteriorating household balance sheets (especially via house price declines) and the impact that will continue to have on spending. Doesn't even get into the topic of US mortgages being non-recourse and potential for large scale walk-aways. Corporate earnings have been sustained by slashing jobs, hardly a recipe for recovery. ...Deleveraging means paying down debt instead of paying out dividends or buying in stock... 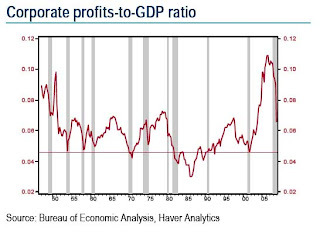 The growth rate in of earnings per share thus is likely to be worse than that indicated by profit margins alone.... Those margins, far from being depressed, remain near historical highs. ... bottom-up company analysts forecast an unprecedentedly mild contraction in profit margins in the midst of the worst recession since the Great Depression. "This just doesn't make sense to us," Edward writes in his Global Strategy Weekly. "Analysts are 'anchoring' on recent unprecedented high in margins as the new norm, instead of viewing them as bubble nonsense never to be seen again." WHAT ABOUT THE EQUITY MARKET? Well, we have a sneaking suspicion that the nearby peak was May 8 when the yield on the 10-year T-note was 3.29%. That was the tipping point for the stock market, which has only done backing and filling ever since; and some wild swings (three triple-digit up Dow sessions; four triple-digit down days). We would have to think that a 4.63% yield compares quite favourably with a 2.6% S&P 500 dividend yield — the spread hasn’t been that wide in at least eight months. Not only that, but the stock market has become increasingly “less cheap” — over the last six months, 2009 consensus earnings estimates have been pared from +30% growth expectations to a mere +9%. The S&P 500 is trading at multiples of around 17-18x, which is no bargain in our view. Keep in mind that the S&P 500 and the Dow are back to January 12th levels. At that time, the bond market offered very little in the way of any serious competition as the 10-year T-note yield was sitting at 2.3%. Now the same levels of the stock market are competing with a 3.72% yield. 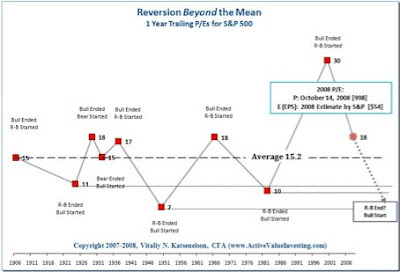 Attempting a mean reversion in this new paradigm implies much more pain. 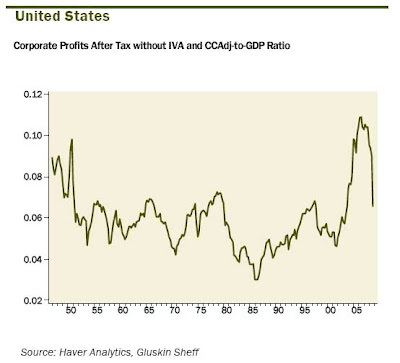 As the chart below from Gluskin Sheff demonstrates, there is still likely a big drop in corporate earnings as long-term Profit-to-GDP reverts to its historical mean of 4.5% (currently at 6.6% with a peak of 11%). 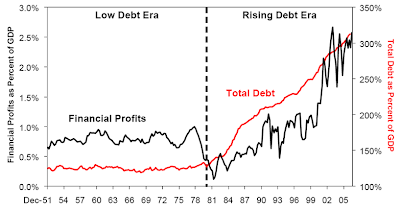 UPDATE: Here is a graph (from a great T2 Partners presentation, click on it for a larger version) showing how dependent financial profits have been on the steady expansion of debt since the early 1980s. History suggests caution is still important with respect to risky assets such as equities, no matter that the market's value has already been cut roughly in half. There are a multitude of large downside risks and little potential for a sustained bull market given the amount of deleveraging that must still occur. If best case scenarios were to be close to flat performance for a number of years, wouldn't that be a good argument for underweighting of such an asset relative to other asset classes, or at least a lowering of expectations that a "buy and hold" approach to an index of stocks could yield anywhere close to 8-10% annually over the next decade? Cash has less downside risk, corporate bonds pay a high yield relative to stock dividend yields but are less risky than stocks (except inflation risk and perhaps political policy risk), treasuries may do well again (perhaps extremely well) as a safe haven and deflation play, etc... Of course I am not an investment advisor so you are warned again to make your own determinations, but my hope is that (a) people won't jump back in the market with both feet after this latest 30-40% rally due to fear of missing the next great imminent bull market in stocks, and (b) people are aware of the very real possibility of significant downside in stocks from here.